Among the signs/symptoms of arteriosclerosis are: sudden weakness, facial or lower limbs numbness, confusion, difficulty understanding speech and problems seeing. Arteriolosclerosis, unlike atherosclerosis, is a sclerosis that only affects small arteries and arterioles, which carry important nutrients and blood to the cells. Diagnosis can be based on a physical exam, blood test, EKG and the results of these tests (among other exams). Treatment is often in the form of preventative measures of prophylaxis. Drug therapy for underlying conditions, such as drugs for the treatment of high cholesterol, drugs to treat high blood pressure (ACE inhibitors), and anti-coagulant drugs, are often prescribed to help prevent arteriosclerosis. Lifestyle changes such as increasing exercise, stopping smoking, and moderating alcohol intake are also advised. Experimental treatments include senolytic drugs, or drugs that selectively eliminate senescent cells, which enhance vascular reactivity and reduce vascular calcification in a mouse model of atherosclerosis, as well as improving cardiovascular function in old mice. Angioplasty and stent placement: A catheter is first inserted into the blocked/narrowed part of your artery, followed by a second one with a deflated balloon which is passed through the catheter into the narrowed area. The balloon is then inflated, pushing the deposits back against the arterial walls, and then a mesh tube is usually left behind to prevent the artery from retightening. Coronary artery bypass surgery: This surgery creates a new pathway for blood to flow to the heart. Taking a healthy piece of vein, the surgeon attaches it to the coronary artery, just above and below the blockage to allow bypass. Endarterectomy: This is the general procedure for the surgical removal of plaque from the artery that has become narrowed, or blocked. Thrombolytic therapy: is a treatment used to break up masses of plaque inside the arteries via intravenous clot-dissolving medicine. 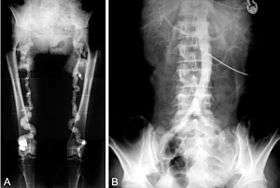 This phenomenon may have existed since ancient times; however, its diagnostics and clinical implications were not recognized until the 20th century. While many cases have been observed and recorded, the term arteriosclerosis was not used until Jean Fréderic Martin Lobstein coined it while he was analyzing the composition of calcified arterial lesions. The name comes from the Greek words αρτηρία, meaning artery, and σκληρωτικός, meaning hardened. ↑ "NCBI - WWW Error Blocked Diagnostic". www.ncbi.nlm.nih.gov. Retrieved 2015-06-19. 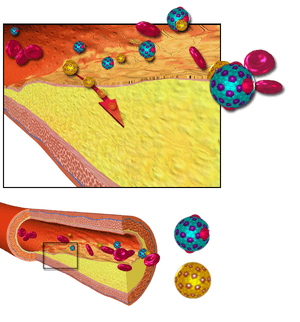 1 2 3 "How Is Atherosclerosis Diagnosed? - NHLBI, NIH". www.nhlbi.nih.gov. Retrieved 2015-06-19. ↑ Rubin, Raphael; Strayer, David S.; Rubin, Emanuel (2011-02-01). Rubin's Pathology: Clinicopathologic Foundations of Medicine. Lippincott Williams & Wilkins. ISBN 9781605479682. ↑ "The Pathology of Atherosclerosis: Plaque Development and Plaque Responses to Medical Treatment - The American Journal of Medicine". www.amjmed.com. Retrieved 2015-06-19. ↑ Diehm, C.; Allenberg, J.-R.; Nimura-Eckert, K.; Veith, F. J. (2013-11-11). Color Atlas of Vascular Diseases. Springer Science & Business Media. ISBN 9783662062876. ↑ Mohan, Harsh (2012-11-30). Pathology Practical Book. JP Medical Ltd. ISBN 9789350902660. ↑ "hyperplastic arteriosclerosis". Retrieved 2015-06-19. 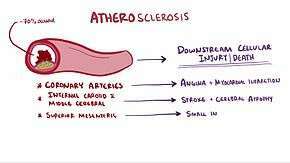 ↑ "hyaline arteriolosclerosis". Retrieved 2015-06-19. ↑ "ACE inhibitors: MedlinePlus Medical Encyclopedia". www.nlm.nih.gov. Retrieved 2015-06-19. ↑ Roos CM, Zhang B, Palmer AK, Ogrodnik MB, Pirtskhalava T, Thalji NM, Hagler M, Jurk D, Smith LA, Casaclang-Verzosa G, Zhu Y, Schafer MJ, Tchkonia T, Kirkland JL, Miller JD (2016). "Chronic senolytic treatment alleviates established vasomotor dysfunction in aged or atherosclerotic mice". Aging Cell. doi:10.1111/acel.12458. PMID 26864908. Retrieved 2016-02-15. ↑ "Angioplasty: MedlinePlus". www.nlm.nih.gov. Retrieved 2015-06-19. ↑ "Coronary artery bypass surgery". MedlinePlus. ↑ "Atherosclerosis -Treatment". UK NHS. Retrieved 21 November 2013. ↑ "Thrombolytic therapy: MedlinePlus Medical Encyclopedia". www.nlm.nih.gov. Retrieved 2015-06-19. ↑ "Atherosclerosis". Merck Manuals. Retrieved 13 February 2015. ↑ Mayerl, Christina. "Atherosclerosis research from past to present". National Center for Biotechnology Information. PMID 16612625. ↑ Copstead-Kirkhorn, Lee-Ellen C.; Banasik, Jacquelyn L. (2014-06-25). Pathophysiology. Elsevier Health Sciences. p. 322. ISBN 9780323293174. Retrieved 25 July 2016.